Is your iPod or PC woefully bereft of MP3s? Then OWL Music Search can help you find more tracks that you'll actually like based on what songs you already enjoy. Like other music discovery services (Last.fm and Pandora), Owl analyzes the tracks that you like and recommends similar tracks with the same musical properties. The difference is that instead of entering an artist's name, Owl asks you to pick a particular song and select the part of it that you like the most to figure out what other songs you'll like. 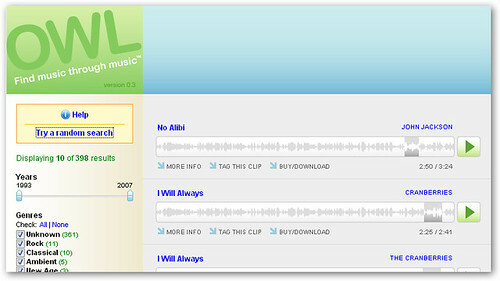 You actually have to browse for an MP3 on your computer, specify its location, and then use the browser-based audio player to select the part of the track that you want analyzed. It might be more complicated, but it might also give you better results since some artists create music that transcends genres (but you only like some of their work). You can also just browse and listen to random songs by clicking the random search button. Of course, Owl isn't perfect. It won't always find songs that you like, but it's an interesting alternative to the other ways of finding new songs.